When Zheng He was born his given name was Ma He. He was born in the Yunnan Province in 1371. His father and grandfather were Muslim leaders of the Mongol Yuan Dynasty. However, when the Ming Dynasty took over, Chinese soldiers captured Ma He and took him as a slave to one of the Emperor's sons, Prince Zhu Di. Ma He served the prince well and rose in the ranks of the servants. Soon he was one of the prince's closest advisors. He earned honor and the prince awarded him by changing his name to Zheng He. Later the prince became the Emperor of China as the Yongle Emperor. The Yongle Emperor wanted to show the rest of the world the glory and power of the Chinese Empire. He also wanted to establish trade and relations with other peoples of the world. He named Zheng He Chief Envoy and instructed him to put together a fleet and explore the world. Zheng He commanded a large fleet of ships. His first voyage is estimated to have had over 200 total ships and nearly 28,000 men. Some of the ships were large treasure ships estimated to be over 400 feet long and 170 feet wide. That's longer than a football field! They had ships to carry treasure, ships to carry horses and troops, and even special ships to carry fresh water. Certainly the civilizations that Zheng He visited were amazed at the power and strength of the Chinese Empire when this fleet arrived. Zheng He's first voyage lasted from 1405 to 1407. He traveled all the way to Calicut, India visiting many towns and ports along the way. They traded and made diplomatic relations at the places they visited. They also battled pirates and even captured one famous pirate leader and brought him back to China with them. Zheng He would continue to sail on additional missions over the rest of his life. He traveled to many far away places, going all the way to the African coast and establishing trade relations with over 25 countries. He brought back all sorts of interesting items including animals such a giraffe and camels. He also brought back diplomats from various countries to meet with the Chinese Emperor. It is believed that he died during the seventh and final treasure mission. Another translation of his name is Cheng Ho. You will often see him referred to as Cheng Ho. He also went by the name of San Bao (which means Three Jewels) while serving the prince. 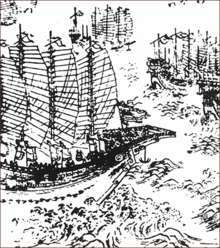 The ships that Zheng He sailed were called "junks". They were much wider and larger than the ships used by the Europeans in their explorations. It is thought that some of Zheng He's ships may have rounded Africa at the Cape of Good Hope. They may also have visited Australia. He served three different emperors: his first six missions were under the Yongle Emperor, he was a military commander under the Hongxi Emperor, and made his final mission under the Xuande Emperor.